Two Book Friday!!! A couple of weeks ago Aunt Gail gave the little one a stuffed bunny for Easter and that was a big hit, and, since it is a spring book we have Thumper and the Egg. This is a level one World of Reading book as Jazz is really starting to pick up the words. 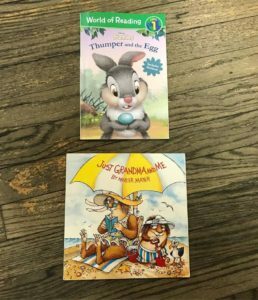 Also this week we have Just Grandma and Me from the Little Critter series by Mercer Mayer, although Thursday is usually Grandma visit day we have a Grandma book on Friday.